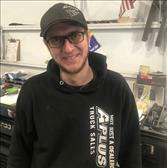 At Aplus I help with sales, locating new inventory and manage the autobody/collision department. My personal vehicle is a 2018 GMC Duramax outfitted with a rough country 5" lift and krypotonite upper control arms. My fiance and I Currently have no children but do have two awesome dogs Norton and Bondo, when im not here working I enjoy the outdoors snowmobiling,boating and hanging out with my family and friends. I also enjoy hitting the drag strip with my 2001 chevy 3500 nick named "mini maxx" with a fully built twin turbo duramax motor pushing over 1000hp. 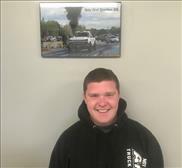 With 14 years experience in the automotive field I'm eager to help you get into the new truck you've been dreaming of!! 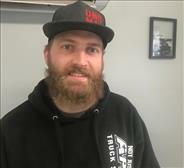 Graduate of Umaine Orono bachelor degree in construction management, made the switch from the construction field 4 years ago to team up with Andrew Coppersmith as a owner in Aplus trucks. 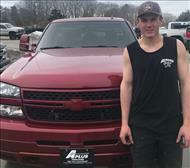 At Aplus I help with sales, manage the service department and oversee day to day operations with Andrew. My current daily driver is a 2016 Denali Duramax with an industrial injection fuel system and has a fixed vane turbo pushing 750hp. For the track I have an 06 LBZ Duramax nicknamed "Roxy" currently under construction with a built motor, exergy fuel system etc. Outside of work I enjoy Sebago lake, my family, my dogs, snowmobiling and adventures with my girlfriend. I started at Aplus Autobody as a general body shop helper in 2012 before Aplus Trucks was founded. I've been in and out of the industry for the past ten years. I graduated from UMaine Orono in 2012. I rejoined the team two years ago as just a salesman and worked my way up to the General Manager. At Aplus I handle both Service and Sales along with all the scheduling, parts ordering, accessories, website, and marketing. In my free time I enjoy hanging out with family and friends snowmobiling and going out to eat and traveling with my girlfriend Victoria. My current daily driver is a 2012 Regular Cab LML with a 65mm Danville stage 2r turbo and some other goodies. 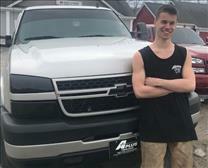 I have a passion for helping customers make their vehicles their own! 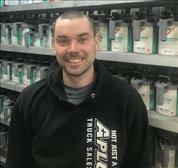 I started with Aplus back in December of 2018 to open the doors on a wide range of new financing options for customers to make it an even easier process to purchase a truck from us.  I have been in the industry since 2014 starting in sales with Porsche Audi. After working up I was the F&I manager at a major Gm dealer. Prior to starting here I myself was a customer. I currently drive a 2015 Gmc Slt crew cab color matched front end with 20x10 black wheels. In my free time I enjoy snowmobiling or hitting the road on my strretglide. 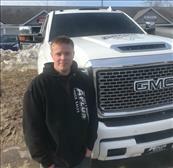 I look forward to helping you get into the truck you've been dreaming of !! Started at Aplus 3 years ago when the Windham location opened its doors . I started as just a parts runner, from there my passion for diesel trucks grew and grew. I did one headgasket stud job with Andy after hours and from there I was hooked. In my off time I enjoy hanging out with my family and friends dirtbiking and helping my girlfriend with her bakery. I currently drive a 2014 Gmc all terrain 1500. Been at Aplus since 2011 when the doors first opened. Andrew gave me a great opportunity to pursue working on vehicles, which I'm very passionate about. The business started to evolve into much more then just an autobody shop. 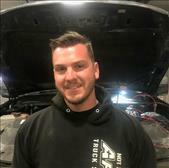 When Andy came into the company we really ramped up, which is when I stepped up from being an autobody technician to a shop manager and an automotive technician also. When we made the move to Windham they offered me a chance to advance my skill set and take on bigger projects and the rest is history. I love what I do and can't picture myself doing anything else for a career. My current daily driver is a 2009 Chevy 3500 dual rear wheel color match front end slammed rolling on 24" alcoas I have many more plans for this truck! 14 years experience in the auto body field, 8 years of that being in custom paint . I like to hunt & fish in my spare time. I-car certified. 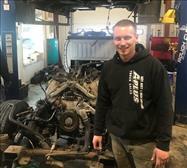 Northern Maine Community College graduate from the Auto body course. My daily driver is a 2011 2500hd crew cab. Started at Aplus 5 years ago right out of high school Andrew and Andy gave me a great opportunity while in gray as an entry level technician. From there I followed the business to Windham. I enjoy what I do from small maintenance to full engine builds. On my free time I enjoy spending time on the lake or on two wheels. I currently drive a 2015 gmc denali 1500 lifted with 22" sota novokanes.